Photograph dated 1905 of Edith M. Fairbrother. 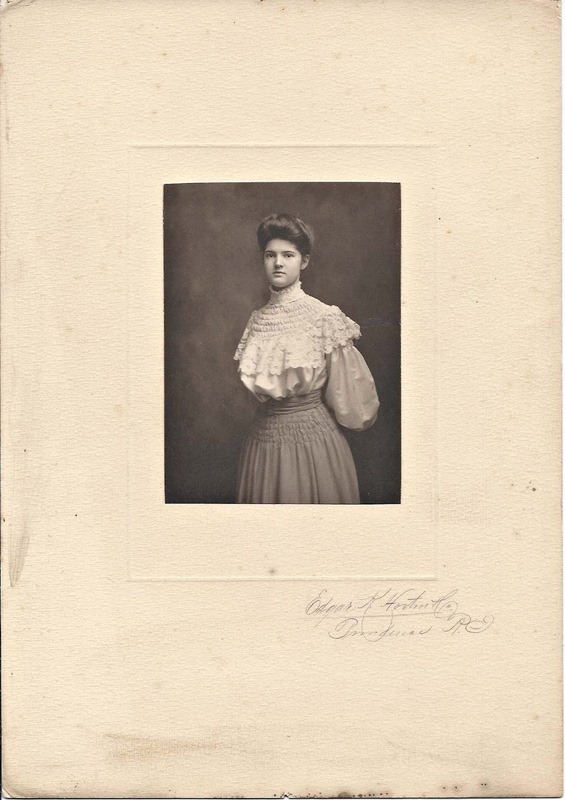 It was found with similar photographs of graduates of Technical High School at Providence, Rhode Island, so Edith may have been a student there as well. The photograph itself is 4" x 3"; mounted, the piece is 10" x 7". The 15 other photographs show 7 men and 8 women. Most of the photographs, if not all, were taken by the Edgar K. Horton studio of Providence. 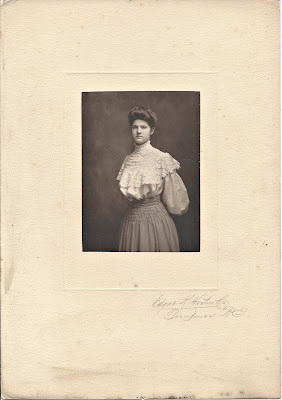 Edith Marcia Fairbrother was born 29 April 1887 at Providence, Rhode Island, the daughter of Frederick A. and Emily (Coit) Fairbrother, who were born at Brooklyn, New York, and Bristol, Rhode Island, respectively. Frederick's name may have been spelled Frederic; I found both spellings. Edith's paternal grandparents were Frederick Augustus Fairbrother and Amelia Douglas (White) Fairbrother. 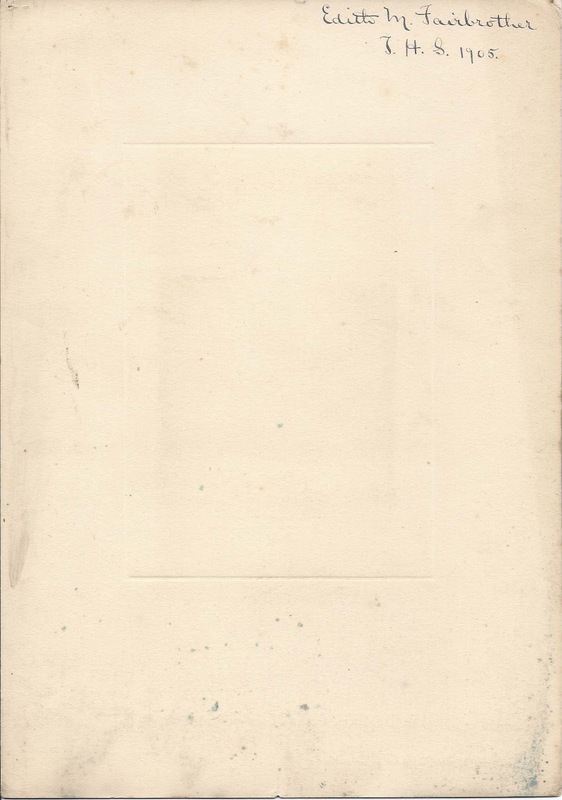 Her maternal grandparents were David Ambrose Coit, Jr., and Harriett (Coggeshall) Coit. On 27 September 1913, Edith married Arthur Lewis Denton, son of Lewis James Denton and Emily Dunn (possibly Brown, daughter of Moses Brown but I haven't yet verified). Arthur was born 18 September 1883 at Plainfield, New Jersey. By the time of the 1920 Census, the couple was living at Wakefield, Massachusetts, with two young children, a son and a daughter. Arthur was working as a paint salesman. By 1930, the family of four was still living at Wakefield, Massachusetts. Arthur was managing a paint concern. By 1940, nothing had changed, except that Arthur declared his occupation again as paint salesman and their son was out of the household. Arthur and Edith apparently retired to Melrose, Massachusetts. Arthur died there in 1966, and Edith in 1975.